Sinn Féin’s leader in Northern Ireland has denied claims she had been ready to strike a deal with the DUP only to be overruled by “senior party figures”. 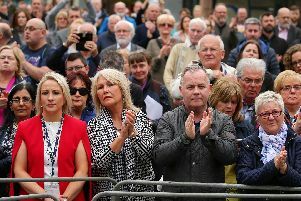 The Irish Times reported on Wednesday that it was the belief of the Irish government that Michelle O’Neill was prepared to compromise in order to restore power-sharing. The newspaper reported that “informed sources” had said that belief was shared both in Dublin and by the Secretary of State for Northern Ireland, James Brokenshire. The Irish Times said “figures on Sinn Féin’s executive board” disagreed with Mrs O’Neill about whether to compromise on the Irish language, a key issue holding back any deal. Mrs O’Neill dismissed those reports. Speaking to the press on Wednesday, she was asked whether there was any truth to the reports. One of those who sits on the executive board is Gerry Adams, who on Wednesday in the Irish parliament accused Irish Taoiseach Leo Varadkar of being behind a “misleading government briefing” to The Irish Times. Mr Varadkar, responding, described Mr Adams as “the great misleader in Irish politics”.